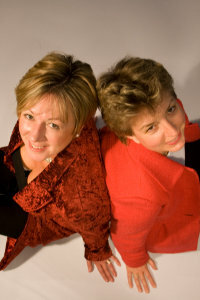 Linda Banister and Tracy Francksen of Red Door Coaching and Training Ltd have opened their door to work with local people and businesses after 25 years working for Marks and Spencer in HR and Training. Red Door offers a wide range of training, coaching and facilitation solutions and work with people at all levels. Linda Banister and Tracy Francksen from the Cotswolds were job share partners covering the South West as Regional Training Managers for Marks and Spencer until Autumn last year. After having fantastic careers with the retailing giant working across the U.K and assignments in Europe and the Far East, they have set up their own training and coaching company to work nearer to home. At Red Door they provide practical, bespoke training and coaching solutions for the real world. Tracy added “We want to work with local companies small and large to support them with their business challenges and through the recession. We need to put our CIPD coaching qualifications and training expertise to good use and we want to do it in the community where we live. We pride ourselves on delivering high quality solutions that are effective, interactive and fun”. The Red Door team have a great website www.reddoorcoachingandtraining.co.uk which has much more information about what they are doing, who they are working with and what they offer.